Most people associate my blog with Pathfinder, or with general gaming advice. The same can be said of a lot of the projects I work on, and the content I produce. However, I've been doing more and more stuff for 5th Edition this last little while, and I thought I'd take this Monday's update to draw some folks' attention to it. Particularly the readers out there who enjoy my ideas and flair, but who aren't about that Pathfinder life. Come on, you know you're curious. I've written for Total Party Kill Games in the past, but this summer I embarked on a new project for them. The goal was to write smaller, one-shot modules with engaging stories you can either run on their own, or fold into a bigger campaign. Each adventure is unique, setting-neutral, and can be run in a handful of hours with minimal prep work on the DM's part. 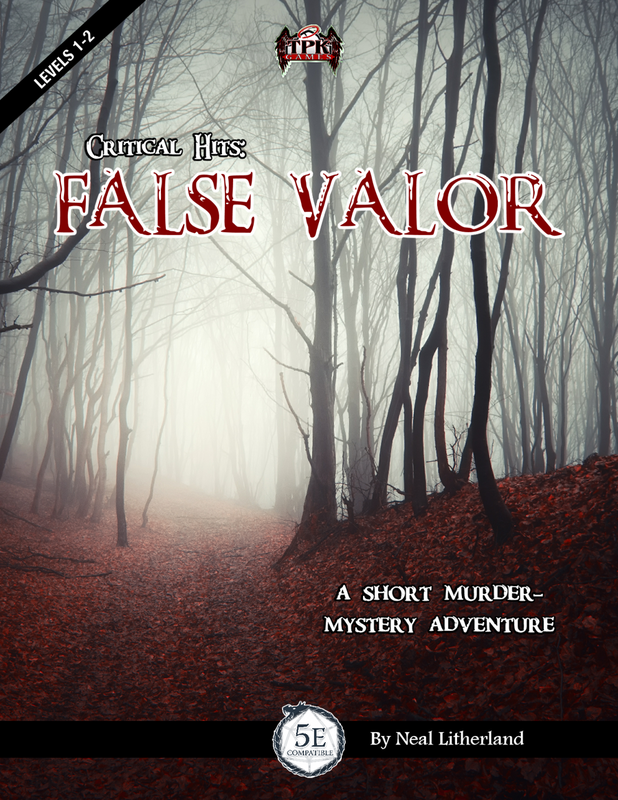 The series is being called Critical Hits, and the first one to come out is False Valor. 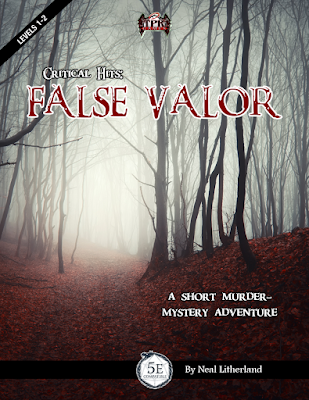 For DMs who are tired of dungeon crawls, or hack-and-slash setups, this module gives your players a murder to solve. A young girl has been killed in a way that hearkens back to a war settled for several generations now... but if her death isn't solved quickly then that old tinder might spark back up! There will be other installments in this series, as well as a few miscellaneous projects I've got in the works. Still, I wanted to make sure everyone knew where to look if they needed a solid one-shot. Seriously, how many times would this have come in handy? I've been creating content for Azukail Games for a little over a year now, and I even wrote about some of the supplements I'd done back in May when I posted Random Tables, Courtesy of Azukail Games! Well since that update, I've been asked to generate some 5th Edition-specific stuff (both writing new guides and converting old ones). And since it's been a tic, I thought I'd update you on what we've brought out recently. - 100 Bits of Miscellaneous Tat To Find: A collection of treasure and swag that's all valued under 1 gold piece, this was my first supplement for Azukail Games. After a bit of re-tooling, it's been re-released for 5E play. 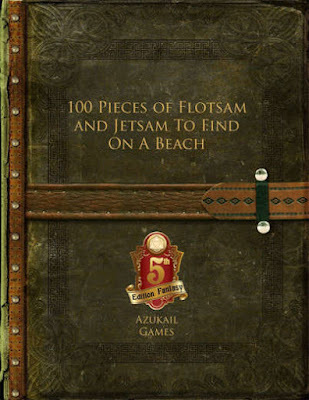 - 100 Pieces of Flotsam and Jetsam To Find On A Beach: Whether it's a great lake, an inland sea, or the edge of the ocean, this guide is full of odd encounters, weird treasures, and grisly finds that PCs can find along the beach. Another oldie, re-tooled to make 5E DMs' lives easier. - 100 Encounters in a Fey Forest: If your party is traveling through a fey domain, there are all kinds of weird things they might see, hear, or be subject to. This guide gives you some ideas for encounters, only a few of which are combat-oriented, that can help spice up their travel. - 100 Random Encounters For On The Road, or in The Wilderness: Another collection of encounters, this one is also relatively light on the combat. From hidden treasures, to forgotten ruins, to riddling statues and wandering merchants who may not be all they appear, the wilderness is full of potential for odd or unusual encounters. - A Baker's Dozen of Rumours (And The Truth Behind Them): An ideal supplement for DMs who want lore, rumors, and a clear path to set their players on, each of these installments is beefy enough that you could run an entire sessions around getting to the truth. Or you could just fold them into your existing setting/campaign if all you need is a little extra meat in case your players step off the beaten path. When it comes to gaming supplements, modules, guides, etc., I've always got something new coming out. These are just my most recent releases geared toward 5th Edition. If you're curious, check 'em out. If you like them then please leave a review, and tell your friends about them! The more folks make it clear that they like what I'm putting out, the more stuff I'll get green-lit in the future. And if you've already got any of these, feel free to leave recommendations in the comments! That's all for this week's Moon Pope Monday installment. If you'd like to see more from me then check out my Vocal archive, or go to my Gamers page just to see my tabletop stuff. You might also want to check out the YouTube channel Dungeon Keeper Radio where I work with other gamers to make videos for dungeon masters and gamers alike! To stay on top of all my releases, follow me on Facebook, Tumblr, and Twitter. If you'd like to support me work, Buy Me A Ko-Fi to leave a one-time tip, or go to The Literary Mercenary's Patreon page to become a regular patron. Lastly, you can Buy My Books if you'd like to check out some of my fiction! Do you need to write a narrative essay outline? No problem, We'll help you! I hate writing essay, it is like the worst thing in the world! But what I hate to do the most is to write a thesis statement. They are never good enough, weak, or senseless. On one of the students’ forums I stumbled upon a comment where a guy told about a thesis statement generator which can create thesis statements for you. I was very skeptical because it sounded like a total fraud, but decided to check it. And you know, he didn’t lie! This generator works. Awesome tool for such student as I who can never write a good thesis statement.